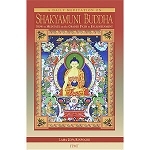 Lama Zopa Rinpoche has specifically compiled this essential daily practice for his students and anyone else wishing to start their day, and all their activities, with a perfect Dharma intention and bodhichitta motivation. It includes the following practices and mantras to make one’s life highly beneficial for oneself and others. 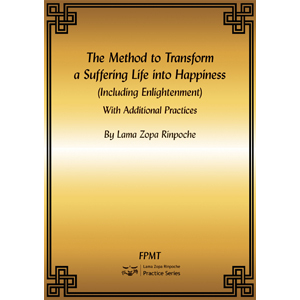 "The Method to Transform a Suffering Life into Happiness (Including Enlightenment)" is a compilation of an inspiring lamrim prayer by Dorje Chang Lozang Jinpa, two key thought transformation verses, and special verses from Shantideva’s Engaging in a Bodhisattva’s Deeds about how to live your life for others. "Blessing the Speech According to the Instructions of Great Yogi Khyungpo" involves the recitation of several mantras to make the power of your speech perfect, multiply the power of your mantra recitation by ten million, prevent the power of your speech from being taken away by eating wrong foods, and transform even your gossiping into the recitation of mantra. "Daily Mantras" include mantras to bless your rosary; to multiply whatever virtuous activity you do by a hundred thousand; to purify anyone who talks to you, hears your voice, and touches your body; to purify heavy negative karmas and consecrate holy objects and rocks, trees, and so forth; and to bring about the fulfillment of all wishes. 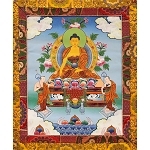 "Mantras for Specific Occasions" includes a mantra that multiplies whatever Dharma texts you read millions of times and a mantra to bless your feet, as well as car wheels, so that any sentient beings who die under them are reborn in a deva realm. 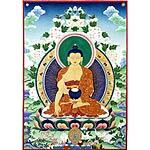 A commentary by Lama Zopa Rinpoche to all these practices is available. 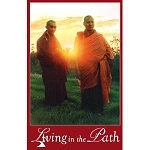 The complimentary module “The Method to Transform a Suffering Life into Happiness" from the Living in the Path program includes short video clips of Lama Zopa Rinpoche explaining these practices.